The Mother of all Smartphones? 624 Mhz Processor and an ATi Graphics Chip. Dual usage QWERTY keyboard (magnetically attached) for text input and screen protection. I’m not sure if it can leap tall buildings in a single bound, but it seems to be able to do about everything else. However, there is a price to be paid for this feature set, the street price is about 850 USD. For more information regarding the HTC Advantage, visit the HTC website. 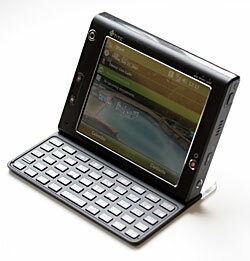 For Reviews and Commentaries, visit MobileTechReview, Pocket PC Thoughts, or Engadget. For our US readers, this is a GSM Smartphone so you will be limited to the T-Mobile and AT&T (Cingular) network. This entry was posted on Saturday, September 22nd, 2007 at 17:24 and is filed under Hardware. You can follow any responses to this entry through the RSS 2.0 feed. You can leave a response, or trackback from your own site.